Mouthwash: Benefits & Side Effects - Should You Use Mouthwash? 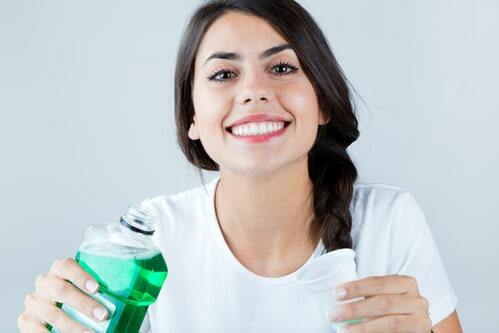 Mouthwash is an integral part of many of our oral health regimes. It’s usually the finishing touch to brushing and flossing, and the last thing we do before we head out the door to work or make our way to bed. There’s a good reason for that. Using mouthwash makes us feel great. It gives us a blast of freshness that just can’t be achieved by brushing and flossing alone, and it eliminates the fear of bad breath that can cripple us in social and professional settings. But, is it good for you? Does it contribute to your dental health or is it causing you harm? Find out below. Aside from minty fresh breath, what else are you getting from your mouthwash? Well, quite a bit it would appear . . .
Swishing and gargling mouthwash is a great way to remove any debris that was left behind after brushing and flossing. It will also remove debris from areas of your mouth that you can’t reach with a toothbrush or a string of floss, such as your cheeks and underneath your tongue. Prevention of gum disease: Gum disease is caused by plaque and other debris becoming trapped in the mouth and creating bacteria. Mouthwash kills this bacteria, meaning it can’t lead to infection and disease. Reduce cavities: Dentist approved mouthwash will contain fluoride. Fluoride assists in preventing cavities by slowing the decay and demineralisation that creates the cracks and holes. Alleviate ulcers: Mouth ulcers are extremely painful and annoying. Mouthwash can numb the area and assist in recovery. Good for prospective mothers: Bacteria in the mouth can move into the bloodstream and create complications during pregnancy. By swishing mouthwash and spitting, the bacteria is expunged from the mouth before it can move into the bloodstream. The most significant side effect of mouthwash is that it masks an essential sign of poor oral health and hygiene. Bad breath is often a sign of a dental issue, such as decay or gum disease. If you’re using mouthwash, you may not be aware of these problems because you won’t pick up on the signs that your body is sending out. Another possible problem of mouthwash is that it can eliminate too much bacteria. Your mouth relies on some bacteria to remain healthy, and mouthwash use, especially excessive mouthwash use, may disturb this balance – in the same way that too many antibiotics can actually make us more prone to getting sick. The loss of this bacteria in your mouth could be quite severe, as this bacteria is responsible for creating the nitric oxide that keeps our cardiovascular system healthy. Of particular concern are mouthwashes containing alcohol. While the evidence is inconclusive, studies have drawn a link between the use of mouthwashes containing alcohol and oral cancer. Australia is lucky enough to have the Australian Dental Association (ADA), which hands out independent information on the dental products that are safe to use. Only ever use mouthwash that is approved by the ADA, you can tell if it is by looking for the ADA logo on the packaging. So, Should I Use Mouthwash? ADA-approved mouthwash is perfectly safe to use, and it will give you fresh breath and potentially contribute to an overall improvement in oral health. However, it should never be used as a replacement for brushing and flossing. Brushing and flossing are the bedrock of your oral health routine; you can’t give up brushing and flossing at night in favour of a five-second swill of mouthwash because your dental health will suffer. You also need to monitor how you respond to use of the mouthwash. Some people get dry mouth after using mouthwash, and this can create dental complications. Saliva is crucial in fighting bacteria in our mouths, so if you notice that your mouth feels dry in the morning, you should discontinue use. You should also check your teeth for any staining or alteration in colour, as this could be a sign that the solution is too harsh and it is wearing away at the enamel. Mouthwash isn’t necessary to a healthy mouth, although it may be a handy complement to your regime. If it’s ADA approved, it shouldn’t do you any harm, but everyone is different. If you notice any issues with use, then please stop using it right away. There are other ways to freshen your breath, so there’s no point compromising your health or comfort.